These are dark days for many non-profits with the threats and realities of extensive cuts in government funding. As a foundation, we are prohibited from influencing elections or lobbying. Our board has a diverse range of political views. We all agree there is a need for continued support for non-profits working in areas such as environmental stewardship, mental health treatment, aid for the disabled, the arts, and more. We provide funding in these areas, and more, focused on Hampden and Hampshire counties in Western Massachusetts. We are limited in how much funding we can provide and can’t come close to matching the scale of the cuts being proposed and implemented at the federal level. We’ve seen this before. The political pendulum swings back and forth. The impact on the organizations we support is unfortunate. Given the uncertainty of their funding and their limited ability to influence it, they have difficulty budgeting and planning. We have seen the cycle play out over the decades with the results of many non-profits failing and most unable to establish a firm base. What are we going to do about it? This has been the conversation we’ve had with many other funders, advocates, and non-profits over the last six months. Complaining without action is wasted effort. The actions we can take must go beyond protest. Those making the cuts, and those who support them, are unmoved by protest and often, emboldened by it. We need alternatives to unstable funding of critical human infrastructure programs. As a foundation, we are required to distribute 5% of our assets each year. It has been difficult to consistently earn back that 5% in the investment markets. While we have been creative over the years in diversifying our investments to capture different areas of responsible growth, we are left feeling that our investments do little to serve our mission. We are not alone in that feeling. The concepts of impact investing have been around for a long time with different names and champions, but the basic idea is the same: align your investments to your mission. We have been researching mission aligned investment options and in October of 2016 voted to engage in our first impact investment. The amount was small, just $35,000, and was matched by a grant to the same organization. The idea however, is powerful. As the first of the Western Mass foundations to engage in this type of funding, we have given the others the signal that it is an acceptable and prudent course. Others, particularly in Berkshire County, have followed our lead. The research we have done in this area has led many to contact us to learn more, and gain an understanding from someone with nothing to sell. Impact investing is just that, investing. We put out money, and expect to get it back plus interest. The amount of expected interest defines the accounting and tax rules governing how we treat that investment. If our expectation is to earn less than the going market rate, it is called a Program Related Investment (PRI). We may treat a PRI as a grant, counting against our 5% required annual distribution. If, however the expected rate of return is at or above market rates, it is called a Mission Related Investment (MRI) and we do not get to count it as a grant. The IRS rules on PRI and MRI have been in existence since the 1969 tax code, but only recently has the IRS provided detailed guidance on how they make determinations on the differences. One challenge we see today is that investments are not what most non-profits need. Instead, they need operating cash flow to use in paying salaries, rent, utilities, and other day to day costs. Typically, operational expenses are covered by program revenue, government funding, or recurring donations. A few non-profits, such as The Stanley Park of Westfield, benefit from large endowments and foundations with dedicated funds. Even still it’s usually not enough to cover all the costs, which is why even healthy organizations like Stanley Park need additional funding to cover their costs and to grow. 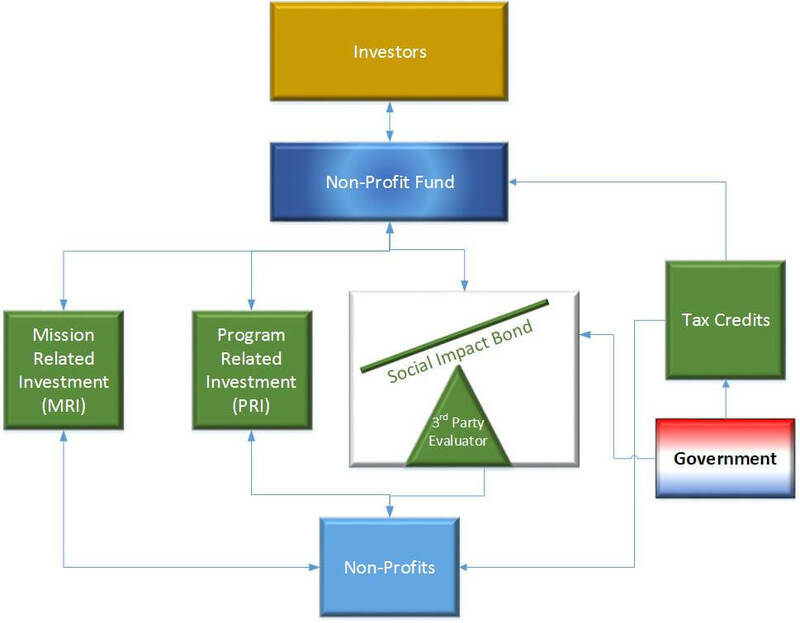 One innovative source of operating funding is called Social Impact Bonds (SIB). These are relatively new, having started in the United Kingdom as part of a “pay for success” model. In this model, a well-established non-profit, with strong data showing the efficacy of their work, writes a bond with a second entity, usually a government. That bond states that in exchange for a set amount of funding, to be provided by outside investors, certain metrics will be met. If met, the second entity realizes savings in excess of the initial investment and agrees to repay the outside investors plus interest. The amount of interest is set by hurdles in the metrics. The determination of how well the non-profit met those hurdles is measured and reported by an independent third party. It’s a complicated model, but one that makes a lot of sense. It accomplishes quite a few things. 1) The non-profit has a secure and predictable income stream for a defined period. 2) The government entity who guarantees the bond, doesn’t need to pay up front. 3) That government entity only needs to pay in the end, if the program worked. 4) Investors can place their investment capital into funding a program that they like. 5) Those investors get paid back if the program works, allowing them to re-invest in other programs later. Let’s look at a recent example here in Massachusetts. ROCA is based in Chelsea and Springfield, providing intervention, counseling, and skills training to young me who have led violent lives. Most have spent time in prison. All have committed serious crimes. ROCA’s methods of incessant mentoring produce proven results, resulting in lower rates of recidivism and criminal behavior. They have entered into a social impact bond with the state of Massachusetts. ROCA was paid an amount by a group on investors. If, at the end of 5 years, an independent evaluators states that the young men in the program have met required outcomes, the state will save considerable amounts in reduced court, jail, and victim assistance, and will repay the investors with interest. Social Impact bonds make a lot of sense, for the non-profit, the investor, and even the governmental agency. I believe they would be palatable to the current mood of the legislators as they would get to claim credit for paying for a program, without having to pay for it now. They would only have to pay back the investors later, under a later administration, and only if the program worked. I think even the “red hat” crowd could agree to that. 1) Non-profits need to have sufficient data on existing outcomes to convince investors to take the risk. 2) Government entities need to agree to set aside funds to repay investors. 3) Investors need to be willing to take the risk and fund these complicated vehicles. 4) Independent metrics review organizations must be prepared to credibly rate the outcomes. This is where we can help overcome the barriers to implementation. As a foundation that gives away significant amounts of money, people will take our calls, and agree to a meeting. Our long-term perspective and relationships with many of the players provide us an understanding of the individuals, and their motivations and limitations. We have had the conversation now with many of the non-profits and funders and there is eagerness to get started. In the coming months, we will work more closely with them to see if we can help them with the infrastructure needed to take on such a daunting, but worthwhile initiative. My hope is that by the next report, we will have some progress to relay. Time is of the essence. The cuts in federal funding are happening now. We can standby and decry the loss, or we can act to try to solve not only the impact of the cuts, but perhaps make progress on the reasons why people would support these cuts. It’s a way of rising above the petty disagreements and politics, to craft a better solution to a complex problem. That’s a role foundations can play. We are seeking a non-profit-focused fund that would look into SIB’s and MRI’s with the idea of vetting and investing in them, and bundling those investments into a fund. That type of structure tends to mitigate risk by spreading and smoothing the variations. Remember that in the investment world, risk is defined as variability, not as the potential for loss. The idea is that by creating securitized funds of sufficient scale, there are sufficient resources for stronger due-diligence as well as the pooled reduction of administrative, legal, and accounting costs. Finally, a fund allows for the lowering of the investment minimum threshold. That means more people can join in helping their communities fund the components necessary. While that may be considered a job for government, clearly many people no longer have faith in the government’s ability to make good decisions and take effective action, so we will have to try to be in the group of those who do! We have not yet found such a fund, but have researched a few that are focused on MRI investments and are considering a major investment into one now. Stay tuned!